danger garden: It's Ruth Bancroft's Birthday! In honor of Ruth's birthday I thought I would republish what I wrote about my very first visit to the garden, in 2012, along with an index of my other visits — should you want to spend some time lusting after the beautiful plants there. The Ruth Bancroft Garden is approximately 3 ½ acres, planted on a former walnut orchard. In 1972 the beds and paths were laid out by garden designer Lester Hawkins, but the plantings were all arranged and done by Mrs. Bancroft. She had been growing potted succulents in greenhouses surrounding her nearby home and finally, with the phasing out of the orchard, she was able to get her specimens in the ground. Back then the garden was private, however upon visiting the garden in 1989, and discussing the lack of preservation plans with Mrs. Bancroft, Frank Cabot was inspired to form The Garden Conservancy (a national organization founded by Mr. Cabot to preserve America’s exceptional gardens), this garden was its first project. Ruth Bancroft is now 104 years old, I heard she made an appearance at the last plant sale. This variegated Agave parryi stopped me in my tracks. I was almost tempted to do an entire post on it alone so you would be sure to properly appreciate it's beauty. Bloomed out dead mother, and pup. Look at the label...do you suppose that means this Yucca was planted from seed in 1968? This Agave obviously believes in sending its pups out, far away from home. These plants were all under cover but it was large enough that you could walk through. 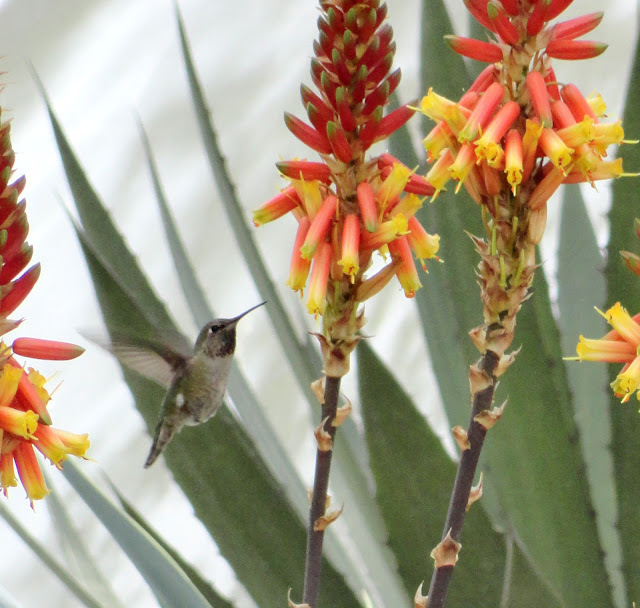 Can you see the hummingbird enjoying the Aloe flowers? Ah, my old plant crush...Aloe capitata var. quartziticola. I fell in love with this plant when we visited the Berkeley Botanical Garden in 2009. This is only the second one I've seen. And that concludes our visit to the Ruth Bancroft Garden, I'm so glad I finally got to visit! Thanks JJ for making it possible. What a nice birthday greeting for Ruth Bancroft! The garden is a wonderful accomplishment, which I hope will continue to be enjoyed for hundreds and hundreds of year. This is a very touching tribute to a time hardy gardener! Now I'll have to look at the 2016 post for comparison. Thanks, Loree. Great visit, and you even met an inspiring aficionado? Even better. That Yucca treculeana flowering so late (last August?) is a surprise, given that garden location seems hot and ours' flower in March. Yes - a big flower. I just picked up the book from the library and have barely been able to tear myself away. Your photos add another layer to the enjoyment and you answered a question I had about her current age, as she seemed to have turned 107 as the book was about to go to press. Viva Ruth! Utterly stunning garden and so many swoon-worthy plants. And an important design concept: Plan out the paths and then you've got your beds all figured out and can start in planting! I missed the 2012 post so I'm glad you reposted. A wonderful garden. I know nothing about desert plants (except for what I read on your blog), but this garden is mesmerizing and mind blowing. Is it appropriate to tell a 109 year old she doesn't look a day over 100? I suppose each day is a celebration, and maybe gardening will keep us all so young and vibrant. Happy belated birthday to an exceptional gardener! Thanks for sharing the 2012 post and the special comment from Ruth's daughter. How awesome is that? That comment from Ruth's daughter is so cool and must have sent you over the moon. Belated happy birthday to a remarkable woman! What a walk down memory lane. Thanks for sharing!